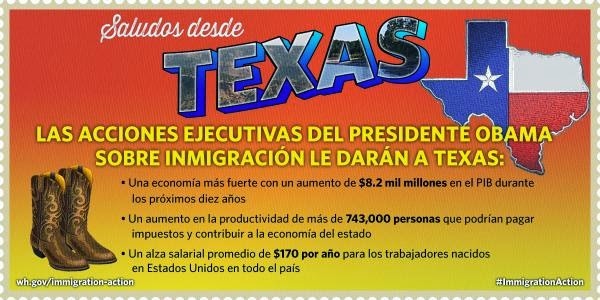 President Jarrett is reportedly the driving force behind a campaign designed to turn Texas blue through illegal immigration, thereby ensuring that all presidential elections end up with a Democrat victor. …The above tweet originated from the La Casa Blanca office, and was then re-tweeted from Jarrett’s own account as well. Within hours of the La Casa Blanca tweet, Jarrett was sharing her views on how wonderful Obamacare is for all Americans – including immigrants. Here’s the other version of the postcard Jarrett didn’t show Americans. Texico, here we come! 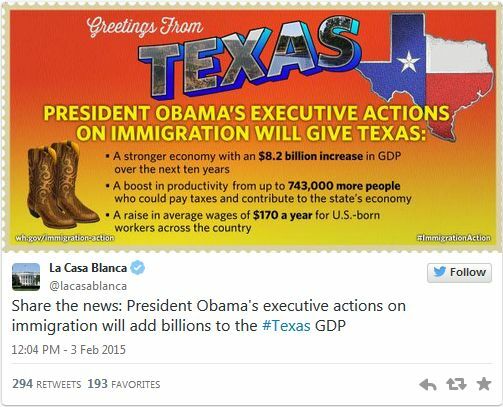 Jarrett is hinting at 743,000 “more people” immediately coming into Texas via the president’s executive amnesty. Logic dictates that within just a few more years this number would easily surpass the one million mark (and likely already has) – a coordinated invasion via the federal government into the only state that gives voters a choice between Republican and Democrat in national elections. The only state that makes such a choice have any semblance of being competitive. One million votes represents the difference between Texas giving a Republican its 38 electoral votes in a national election or those votes going Democrat. It is the difference between Texas being a blue state, or remaining a red state. Valerie Jarrett has been working very hard to permanently alter the Texas electoral landscape to ensure it forever after favors far left Democrats in future elections. You’ve been warned, Texas. Are you going to sit there and take this from the radical left? Or are you going to do something about it? Terresa Monroe-Hamilton is my heroine. Or, do you say hero? Gyro? illegal aliens have kids in this country at the rate of 340,000 every year……….. 1.36 MILLION every 4 years and are changing the political landscape…..very soon Texas will turn blue, its totally inevitable look at the election maps ….at that point with New York, California and Florida the country will be run by Democrats as Republicans take a knee and at best morph into moderate Democrats ,socialism will be the new norm for decades if not forever………………….